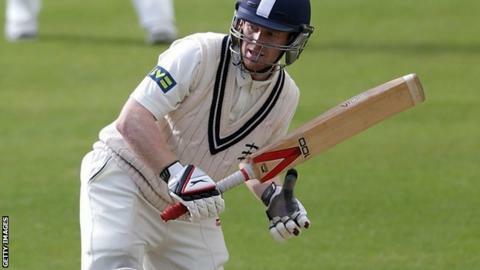 England Test hopeful Eoin Morgan hit his first Championship century in over five years as Middlesex took charge on a rain-affected day against Lancashire. They resumed on 275-3, a lead of nine, and Morgan made 103 before being caught behind by Jos Buttler off Tom Smith. Neil Dexter made 51, while John Simpson (50) and Ollie Rayner (77) shared a century stand before Middlesex declared on 459-8, a lead of 193. The hosts claimed an early wicket as Lancashire closed on 15-1 in reply. Morgan's century was his first at Lord's - and his first for Middlesex since making 114 not out against Leicestershire at Southgate in April 2009. Just as important as his score, however, was the discipline showed in batting for over four and three quarter hours in an innings which featured 12 fours, which underlined his Test credentials. Following his dismissal, Rayner was severe on Simon Kerrigan, but the left-arm spinner took some revenge by finally picking up his wicket. Kerrigan was later pressed into service as nightwatchman for Lancashire after Luis Reece was lbw to Tim Murtagh for two and together he and Paul Horton saw it through to the close. "Middlesex have a great chance of claiming a third win from three matches at Lord's this summer after another day of dominance. "Eoin Morgan led the way with a patient and determined knock. The Irishman showed all the qualities required of a first-class cricketer as he defied the Lancashire attack and a pitch that was showing signs of increasingly inconsistent bounce. "Perseverance has been key for bowlers and batsman alike on what had been a slow pitch throughout but with time moving on, and still only in their first innings, the hosts pushed on with excellent fifties from John Simpson and Ollie Rayner, who really opened up with the declaration imminent after tea. "A rain delay denied Middlesex a long bowl at the visitors but in the nine overs that were possible a shudder would have been sent down the Lancashire batting line-up by Luis Reece's lbw, as the ball kept shockingly low confirming suspicions that the up-and-down bounce had been increasing throughout the match." "The home side have controlled the majority of the game so far, despite Lancashire's tireless work in the field. "Simon Kerrigan did his job well late on after coming out as nightwatchman following the dismissal of Luis Reece. "Kerrigan and Horton will resume just as they did on the final day of Lancashire's first game of the season at Nottinghamshire. "Their partnership that day saw the Red Rose get to within 40 runs of their 350 victory target. A similar outcome would be a huge boost in their bid to save the game."